Experience the tranquility, comfort and personal attention, found at our Luxurious Guesthouse, nestled in the heart of the “Diamond City”. Here everything is done with style and attention to detail. Our seven large and private en-suite rooms allow you a good night’s rest on your holiday or after a busy business day. Beautiful individual decorated rooms in an understated, comfortable and uncluttered style and a huge garden complimented by a big blue swimming pool, awaits you after a long, hot summer day. Do bear in mind we also have a self-catering unit for longer stays. All our rooms are equipped with lounge areas, en-suite bathrooms, air-cons, flat screen TV’s with DStv, fridges, tea / coffee facilities and bathroom amenities and towels. Our Honeymoon suite is available on request and chocolates, sparkling wine or grape juice and flowers is supplied to set that special mood! Hairdryers, irons and swimming towels are available at Reception. A laundry service available Monday to Friday. All our rooms are equipped with safes for the safekeeping of your valuables. A scrumptious English or Continental breakfast is served in our dining room. Lunch and dinner is available on request. Kimberley Manor Guesthouse is close to the newly upgraded “Big Hole and Mine Museum”, Virgin Active Gym, the Kimberley Golf Course, Museums and the Art Gallery. The airport and bus terminal is only a short distance away. Be sure to visit the beautiful Flamingo’s at Kamfersdam, adjacent to the Flamingo Casino and if you have not been on a “Ghost Tour” yet, be sure to make your reservation with us! From the N12 Johannesburg, enter Kimberley along Transvaal Road. At the fourth set of traffic lights, on the corner of Jones and Lennox, turn right and continue over three more traffic lights until you see the Microwave tower on the left-hand side. Take the slipway and turn into Carters Road. Take the second road right onto Michael Street and proceed to No. 24. From the N12 Cape Town, the first set of traffic lights you will come across is the MacDougall and Memorial Crossing. Turn left into MacDougall Street and at the first stop street turn right and continue straight. At the next stop street, turn left into Jacobus Smit Road. At the three-way stop street, turn right and continue straight until you reach Pick n Pay Rhodesdene on the left-hand side. Continue over the four-way stop at Cronin and Carters Road, and at the next stop street turn right onto Michael Street. 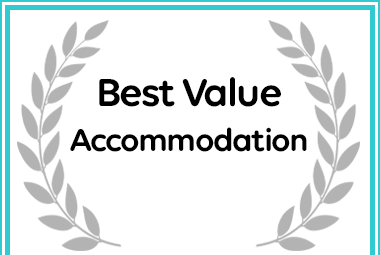 Kimberley Manor Guesthouse received a Best Value Award for accommodation in Kimberley.